You have classes that have dependencies on services or components whose concrete type is specified at design time. 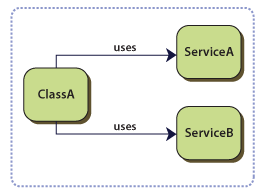 In this example, ClassA has dependencies on ServiceA and ServiceB. Figure 1 illustrates this. To replace or update the dependencies, you need to change your classes' source code. The concrete implementations of the dependencies have to be available at compile time. Your classes are difficult to test in isolation because they have direct references to dependencies. This means that these dependencies cannot be replaced with stubs or mocks. You want to decouple your classes from their dependencies so that the dependencies can be replaced or updated with minimal or no changes to your classes' source code. You want to write classes that depend on classes whose concrete implementations are not known at compile time. You want to test your classes in isolation, without using the dependencies. Delegate the function of selecting a concrete implementation type for the classes' dependencies to an external component or source. The Inversion of Control pattern can be implemented in several ways. The Dependency Injection pattern and the Service Locator pattern are specialized versions of this pattern that delineate different implementations. Figure 2 illustrates the conceptual view of both patterns. For more information about these patterns, see Dependency Injection and Service Locator. In the Configuration Modularity QuickStarts, the class ModuleA defined in the ModuleA project uses dependency injection to obtain a reference to the region manager service, as shown in the following code. Because the ModuleA class is instantiated by a container and an instance of the region manager service is registered with the container, the ModuleA class receives a valid instance of the region manager service when it is constructed. Note that a mock instance of the region manager service can be supplied when testing the ModuleA class by passing the mock instance in the constructor's parameter. The following code, extracted from the NewsModule class of the Stock Trader Reference Implementation (this class is located at StockTraderRI.Modules.News\NewsModule.cs), shows how an instance that implements the INewsController interface is obtained using the service locator pattern. The variable _container holds an instance to a container that has logic to locate a valid instance of the requested type. Note that for testing purposes, you could configure the container to return a mock instance that implements the INewsController interface instead of the real implementation. This enables you to test the NewsModule class in isolation. The following code, extracted from the NewsModuleFixture test class (located in StockTraderRI.Modules.News.Tests\NewsModuleFixture.cs), shows how the NewsModule class can be tested in isolation using a mock instance for the INewsController interface. You need to implement a mechanism that provides the dependencies that are required by the object that is being initialized. There is added complexity to the source code, which makes it harder to understand. Dependency Injection. The Dependency Injection pattern is a specialization of the Inversion of Control pattern. The Dependency Injection pattern uses a builder object to initialize objects and provide the required dependencies to the object. Service Locator. The Service Locator pattern is a specialization of the Inversion of Control pattern. The Service Locator pattern introduces a locator object that objects use to resolve dependencies. Inversion of Control Containers and the Dependency Injection pattern on Martin Fowler’s Web site.